What is a .wtf Domain? Looking for a domain extension that’s sure to make Internet users do a double-take? Consider the .wtf domain. This domain is a truly remarkable option that can be utilized a number of different ways. Whether you own a blog that highlights unbelievable products or you own a business focused on aggressive marketing tactics, the .wtf domain can set you apart from the competition. The unique domain is relatively new. Since it was first proposed as part of ICANN’s new top-level generic domain program, it has seen its share of controversy due to its rather expressive inspiration. Despite the objections, the .wtf domain was officially delegated in 2014. Since then, hundreds of thousands of .wtf websites have been registered. It’s a colorful alternative to boring old .com or .org extensions. The .wtf domain is now seen as the go-to domain extension for websites that are bold, fun, and youthful. Why Choose a .wtf Domain Extension? Anyone who has ever communicated with their friends through text or email understands the significance of the .wtf domain. Those three letters represent an iconic acronym that conveys feelings of amazement and disbelief. The acronym has roots all the way back to the early days of the Internet. It originated in old-school chat rooms and instant messaging. Today, it is part of the everyday lexicon of people young and old. When people see the .wtf domain extension, they will be automatically drawn to your website. It’s a quirky extension that makes people curious to see what your digital space is all about. The acronym, “WTF,” can mean a lot of things to different people. It can be used to display irony, humor, surprise, and a range of other emotions. Businesses and individuals can use this to their advantage and craft a truly unique Internet experience for their visitors. 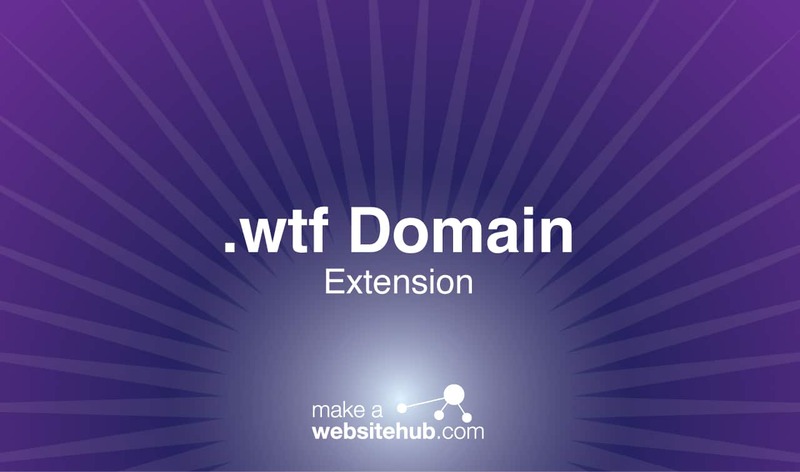 A fun and exciting extension, such as .wtf, will make your website stand out, especially to those who are in the know. The .wtf domain says a lot already in those three simple letters. As a result, it’s quite easy to get creative when using the extension. All you have to do is tack the extension onto your website name and it will automatically capture the attention of unassuming web users. For example, if you’re an online store selling quirky products, you could name your website strangegoods.wtf. The domain tells potential visitors what your company is all about from the get-go. The unique .wtf extension adds a punch of fun, further cementing your status as a brand that’s focused on culture and youth. Speaking of branding, the .wtf domain extension can be used beyond the confines of your digital space. It’s an iconic acronym that many people are familiar with, so why not make it a part of your company’s identity? You can use it on t-shirts, business cards, products, and so much more. The possibilities are endless! Where Can You Buy a .wtf Domain Name? This quirky domain extension is offered by many domain registrars. Despite its in-your-face meaning, the .wtf domain is classified as a generic domain. Therefore, there are no major use restrictions that you have to concern yourself with. It’s open to anyone, regardless of business size or industry. You can register the domain for up to 10 years. Here are some great domain registrars that you should take a look at.